Summertime, and the barbequing is easy. And it’s even more so when the cooking and entertaining is done by means of an environmentally-friendly outdoor kitchen station. There’s a lot more that can be done besides composting the leftover food and recycling the beer and wine bottles starting with the type of grill. An infra-red BBQ uses 25% less fuel than a conventional gas grill. On the charcoal side, there are also brands of both gas cooker and coal that are designed to leave as small a carbon footprint as possible. 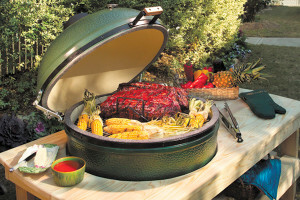 One example of such a cooker is the Big Green Egg brand. One of the challenges of choosing to be environmentally-friendly on every front, including counter tops, is cost. It is and will likely remain a little more expensive to outfit and outdoor kitchen in the most “green” way possible. But it’s worth it. It’s a civic duty now, not to mention a great conversation piece and behavior that can hopefully inspire guests, family and neighbors. By going with bamboo or recycled glass counter tops, you can help others see the light. The good news is that with each passing summer season, there are more and more green outdoor options. The prices are coming down, the selection is going up and so, to it’s become a whole lot easier and affordable to find matching recycled-material table and chairs to go along with the counter tops and infra-red grill. Another great option for furniture is ALD custom-crafted natural stone furniture. Finally, there is the matter of how you choose to light the area. Remember, each and every kilowatt of electricity piping into the backyard has as large a footprint as anything. LED and CFL bulbs are in some cases as much as 75% more energy efficient than incandescent bulbs. Those CFL curly bulbs that we’re all getting used can last ten times longer than a conventional bulb; LED bulbs, 25 times more. As an alternative, ALD can show you how appropriately-placed low-voltage lighting to your outdoor living areas can give the right illumination yet conserve energy use. If you’re interested in adding a little more “green” to your outdoor cooking and living areas, give us a call. We’re in the business of designing beautiful solutions for every landscape.